Poona camp from Parbuttee Hill. bl.uk > Online Gallery Home	> Online exhibitions	> Asia, Pacific and Africa Collections	> Poona camp from Parbuttee Hill. 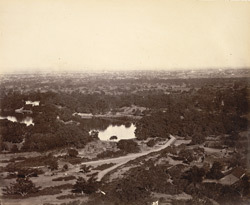 Photograph with a panoramic view of Poona (Pune) town and its cantonment visible in the distance, taken by an unknown photographer, from an album of 40 prints of the 1860s. Pune, the second city of Maharashtra, is located near the Sahyadri Hills of the Western Ghats at an altitude of 598 ms. Its climate being more equable than that of Bombay, it became the summer capital of the Bombay Presidency from 1820. The British cantonment in the north-west of the city is still used by the Indian army. Pune is bordered by the river Mula to the north and the river Mutha to the west. The two rivers join in the north-west to form the Mula-Mutha. Pune is an old Hindu settlement. It reached its zenith of power when it was the capital of the Marathas from the 16th to the 18th century when they were defeated by the British. This view is from Parvati Hill, a landmark of the city offering temples for worship and refreshing breezes with fine views.